I just completed an ice-fishing trip that I had really been looking forward to. Kevan Paul and I had been trying to make plans to get out on the lake that he guides on, Clear Lake in north central Iowa. In mid-January everything came together. We wanted to headquarter out of my CORE ICE shelter, which is a new type of wheel-house that’s much lighter than other types of wheel-houses. A friend of ours towed it to our fishing location with his Polaris side-by-side 4-wheeler. Most houses are too heavy for that, so you can use the CORE ICE in many more situations. The CORE enables anglers to fish while they warm up, then venture out to search for more fish. My friend Gary Sturges, another Clear Lake fishing expert joined us for our morning on the ice. Here’s how it went. Our goal was to catch yellow bass, but the guys said that we might also catch perch, white bass, walleyes, and crappie. We caught all but a walleye. Clear Lake is a very diverse fishery. Yellow bass are a distinctively marked fish and get to about 10 inches in length, sometimes a tad longer. They’re an invasive, so you can keep as many as you want to clean. They’re delicious on the table, so most anglers don’t mind cleaning a bunch of them. Keep in mind, these are only 10-inch fish, but people come to Clear Lake from Texas and Manitoba and everywhere in between to catch them. Clear Lake is home to the Yellow Bass Bonanza. Six hundred (600) anglers from 13 states gather on Clear Lake on a Saturday in February to catch yellows. Kevan Paul with a Clear Lake crappie. We drilled holes in water from 5 to 12 feet in depth, and we drilled nearly 50 of them. We used K-Drills to make holes in the ice. K-Drills are lightweight and quiet. You can easily cover a large area and not wear yourself out carrying a heavy auger, and you don’t need to mix gas. We kept a close eye on our sonar units. If we didn’t see a fish in a couple of minutes, we moved. Sometimes we’d see a group of fish on the sonar, but they wouldn’t bite. Kevan has discovered that if you see fish but they won’t eat, drop a small spoon down and rip it through the fish. If they scatter, they were small perch. If they hang around, they’re yellows. Gary was using a small spoon, Kevan and I were using small jigs mostly. Gary and Kevan caught about an equal number of yellows, I caught fewer. I don’t know for sure how many yellows we caught in our 3-4 hours of fishing, but they will feed a lot of people. Lure color often doesn’t make a difference when it comes to yellow bass, but every now and then it does. If you think they’re yellows and they won’t bite, as with any fishing, try another color, size, or action. 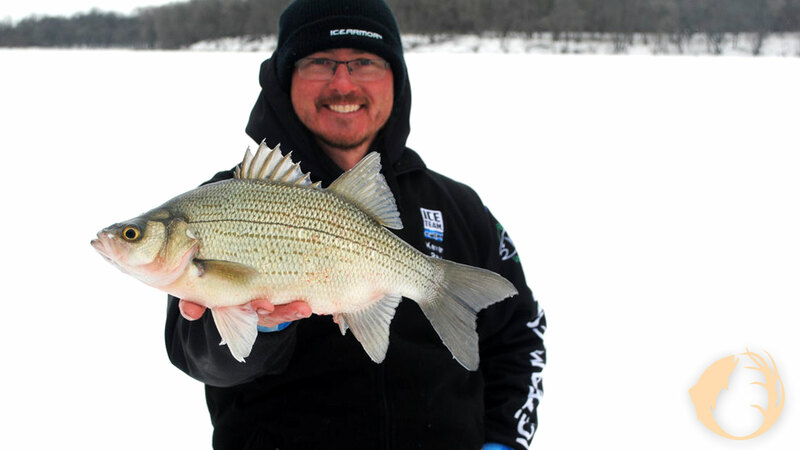 Equipment for these yellow bass through the ice is simple: Spool a reel, I was using a Lew’s Laser Lite reel, with 3-pound P-Line Floroice and a light action rod. Good lure choices include a small Mooska Tungsten jig or a tiny Forage Minnow Spoon in Silver Shiner. Tip them with spikes or waxworms. You might find it hard to believe that anglers would travel seriously long distances to fish for 10-inch yellow bass, but when you start catching them then eating them later, you’ll understand why they do. Visit clearlakeiowa.com to begin a yellow bass adventure.